Oh hello again. Back with another seasonal favourites post. Winter in itself certainly has not been a favourite of mine. I've been so ill for the whole season and am very much looking forward to it being over. Nevertheless, I've got some new favourite products / general things, so I thought I'd share them as always. In all honesty, I haven't worn all that much makeup this winter, which is surprising, because it's usually the season I like wearing makeup most. It's the time of year where makeup will stay on your face and won't slide off throughout the day like the warmer months. However, as a result of being very unwell for the majority of the season, when I have worn makeup it's tended to be very minimal, just using a few staple products to make me look less sick basically. 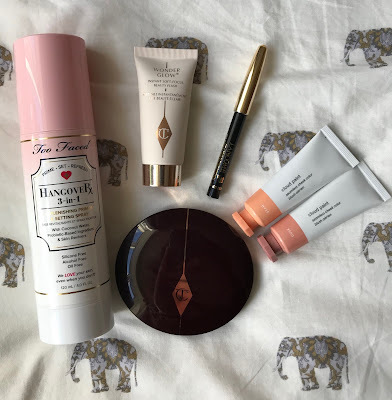 The first thing I've loved is the Too Faced Hangover Priming and Setting Spray. I've never been much of a setting/priming spray girl, but I love this stuff. My skin's been a little more dehydrated through the winter, so this has been ideal. My tinted moisturisers / bb creams have stayed well in place through the whole day during a time that they'd normally start to crumble by the afternoon, and I'm pretty sure that's because of this stuff. Next up is more of a favourite type of product than one particular product. And it's actually blush. Now, I have always been one hundred percent not a fan of blush. I have never liked how it looks on me and always thought it would just make my cheeks look too rosy. But, I think due to my skin looking lifeless and illness ridden (i.e. having absolutely no colour to my skin at all (except maybe a bit of a gross green tint ha)), blush has become a new favourite of mine. In particular I've been loving the Glossier Cloud Paints - I have Dusk and Beam and they both add the nicest flash of colour to my cheeks without being too garish. And also the Charlotte Tilbury Cheek to Chic blush in the shade in First Love, which even just in the pan looks stunning. It adds a really subtle, but very effective rosy glow to my cheeks and may have grown to be one of my all time favourite products ever. Speaking of Charlotte Tilbury, I've also found the Wonder Glow Face Primer to be amazing for brightening up my dull skin. It brings a beautiful glow to my face, and I also really like using it as a cheekbone highlight. Even though it's very subtle on the cheekbones, I think when the sun shines towards you it looks so beautiful and just like you're glowing from within. Lastly, is a product that actually came in my advent calendar. I'm still yet to try everything out thoroughly enough to confirm which products are favourites, but this one was an instant winner. The Lancome Kohl Eyeliner in Noir is so impressive. On the few occasions I've done winged liner this season, I have always put this product on my tightline and it has not budged. It has literally lasted perfectly for a full sixteen hours, and I am so impressed. The only nail varnish I've worn for the past three months has been Essie Ladylike. It's this really gorgeous purple-y, mauve-y cool toned colour and I love it. I have always been someone who loves the darker colours through the colder months, but this has the best icy vibe to it and I haven't been able to bring myself to wear anything else. It's also super long lasting. Usually lasts a minimum of two full weeks with next to no chipping. In the past year I've become a complete Garnier convert. 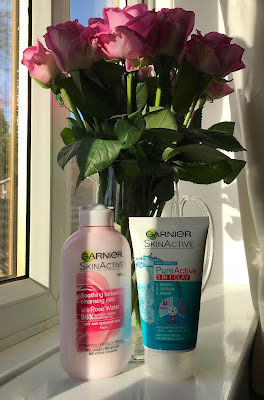 I've always been a huge fan of No7 skincare, and to be fair I do still rate it, but Garnier have been doing wonders for my complexion. Of course, I've been using their micellar water for some time now, but I've recently tried out some newer products; and they're gold. I have been really liking the Garnier Soothing Botanical Cleansing Milk with Rose Water. It's basically a creamy / milky micellar water. You can use it to remove makeup and cleanse your skin, but it has a much more moisturising outcome than the more basic micellar water. This has been great whilst my skin has been dried out by the horrendous wind and stormy weather we've been having. Makes my skin feel great and it's the easiest stuff to use. Also, I'm a big fan of the Garnier Pure Active 3 in 1 Clay. Now, I wouldn't say it was a 3 in 1 product, but rather 2 in 1 - basically because I see a wash and scrub as practically the same thing (when I wash my face I use the product to scrub the dirt out of my skin if you get what I mean. However, it's a great product. I really like using it as a mask; you only leave it on for three minutes so it's a very quick and efficient product, so it's great when I haven't got much time but my skin needs an extra something. A great product even if it's a little less than it says on the bottle. Maybe the last favourites for a while that I'll mention jumpers, yikes. The only reason I'll be sad when the season's over. 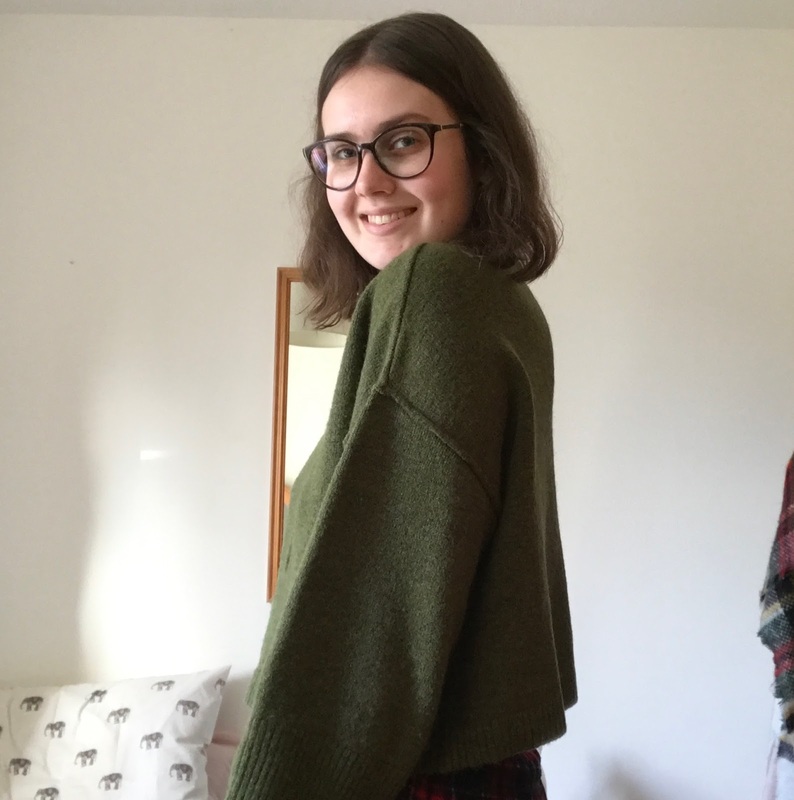 The main favourites have included this new Topshop Green Cropped Jumper (Tall). 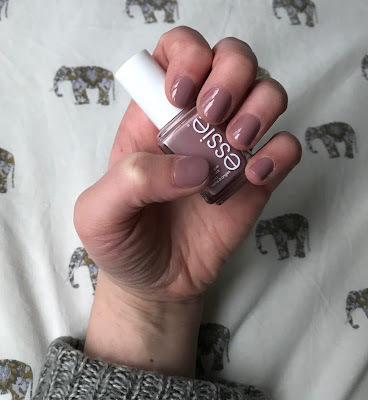 If it wasn't a tall size it would look stupid on me (ha), but this is the perfect length on me and I love the colour - it actually matches my eyes. And a lucky sale find was this New Look Pale Pink Pointelle Jumper (sleeve featured above), which was only £9!! It's so pretty and has a very delicate, feminine look to it. If your local New Look still has a sale rack then I'd definitely have a hunt for this. I've also been loving these Pale Purple Platform Supergas. 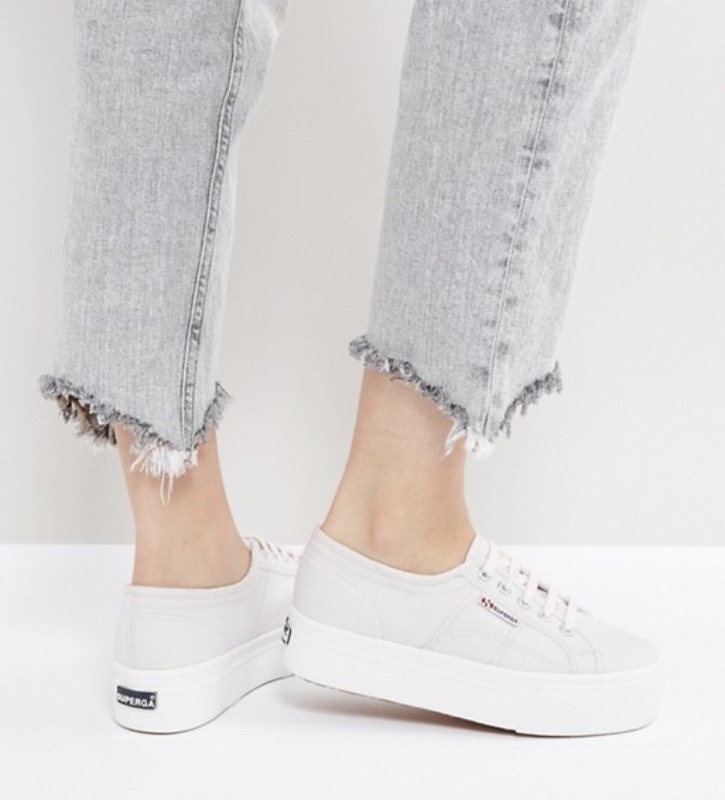 I have some suede platform Pumas, which I adore but am basically too scared to wear at the moment, as the weather it very hit and miss, so when I saw these (and in the sale) I had to pick them up as an alternative shoe to wear. I don't mind too much about dirtying these a little and because they aren't suede I'm okay with them seeing a little rain. 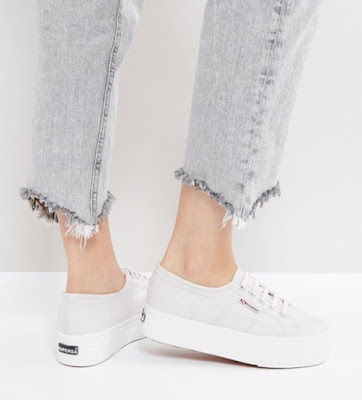 I really loved how platformed trainers elongate your legs with minimum effort and you can walk really comfortably in them. And these are the sweetest pale shade and I know I'll be wearing them for all of Spring and Summer. My favourite books of the season have been The Muse by Jessie Burton and The Power by Naomi Alderman. They're both very different in terms of content and setting / time period etc, but they are both superbly written and executed texts. If you want to hear more about why I liked these two in particular, I've got short reviews of them in my December and January book posts. There have been a few new albums I've loved in the past few months, including one of my all time favourite bands Walk the Moon, who released their third album, What if Nothing, in November. This album reminds me a lot of their debut, being a little less pop than Talking is Hard and going back to the slightly more alternative, generally just different, sound that made me fall for their music initially. A few of my favourite tracks include, Press Restart, Surrender, and Kamikaze. Secondly is Taylor Swift's Reputation. When I heard the first couple of singles I was pretty sure I wasn't going to like the album to be completely honest, and on the first listen to the whole thing I was very unsure about it. I came back to it a few weeks after it was released and listened to it a couple of times through before realising it was obviously a total bop. I love the album, but it did take a while to get used to the new sound. 1989 was the best and this is a very different move from there, but it is, nevertheless, brilliant. My favourite tracks include Delicate, Getaway Car, Call It What You Want, and New Year's Day. Finally, I have been loving A Brand New Me: Aretha Franklin (with the Royal Philharmonic Orchestra). I'm a big Aretha fan anyway, but this is a truly beautiful album of some of her biggest hits, accompanied by the stunning sounds of the Royal Philharmonic Orchestra. There's nothing not to like. The Crown !! Season 2 !! I love The Crown. It's such a wonderful programme and I feel like I'm learning so much when I watch it. My Mum's brought me up to be a major royalist, so I love that the show gives a real insight into monarchy and it's difficulties. It feels really authentic and I think it's an excellent interpretation of our royal family. A serious shoutout to Netflix for getting Friends!! 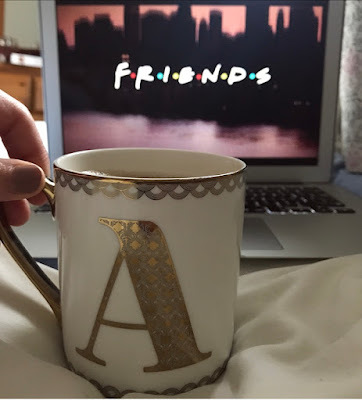 It honestly couldn't have been added at a better time, as I had a lot of time confined to my bed throughout January, and getting to watch Friends was as much of a silver lining as I needed. I haven't properly watched the show since E4 stopped running the repeats, which was a sad, sad time many years ago. So happy that I can watch the show through again. Honestly, I cannot wait for the Spring right now. I normally think Winter is fine, but I've well and truly had enough, and am completely ready for the most beautiful season of the year to unfold. Hopefully I'll rediscover a few old favourites for next season through a well needed Spring cleaning session - and maybe have to repurchase them if I can't remember how foolishly long I've had them. Here's to Spring. The season in which we bloom.